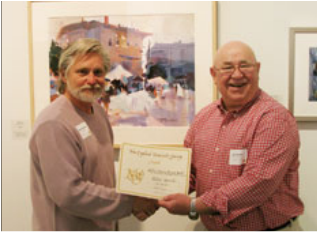 Bob is a graduate of Paier School of Art and has been a professional artist for forty years. A prominent national award winning artist and illustrator, his paintings hang in both corporate and private collections throughout the United States, Europe, and Japan. In November 2009, the New Britain Museum of American Art acquired for their permanent collection a piece from his "Turtle-esque" series, “Catfish with Turtle”. Bob’s work is also featured in “100 Artists of New England” by Schiffer Publishing. He is represented in numerous galleries and teaches and lectures throughout New England. He has illustrated several children’s books and magazine editorials. 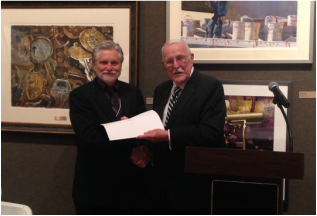 In 2015, Bob became a Signature Member at the American Watercolor Society. Bob is an elected member of the National Society of Painters in Casein and Acrylic, the Salmagundi Club, the Lyme Art Association, the Connecticut Watercolor Society, the Connecticut Plein Air Painters Society, the Connecticut Academy of Fine Arts and he is a signature member of the New England Watercolor Society. Twice, Bob's work has received awards and selected for the AWS traveling exhibition that toured the country in 2011 and 2013. Bob’s passion for art is matched by a natural talent to paint a wide variety of subjects, highlighted by expressive coastal scenes, intimate woodland pictorials and street scenes. Over the past decade, Bob works passionately on large formatted works on both canvas and paper. These studio pieces incorporate his years of observation, rendering and careful studies of aquatic life. This ongoing series is called "Turtle-esque" expressing gestural fluidity in a semi-abstract setting.